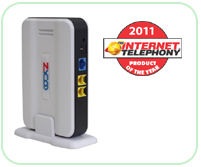 The ZX20 is the first mini IP PBX in the world released in 2010. Based on SIP, it supports 30 extension users, mainly for SOHO&SMEs use. It’s easy to set up and use, highly cost-effective and takes minimal space. Being more flexible, the ZX20 integrates 2 analog ports to support PoE and lifeline pass through.